The figure above is a conventional phase diagram of aqueous NaCl (in water). A phase diagram shows the phases that exist in a multi-component system as a function of temperature and the concentration of one of the components and is often used to describe the effectiveness of a deicing salt (by % mass) on depressing the solution freezing temperature (i.e., the liquidus line). The phase diagram can be analyzed using three paths as shown in the Figure to show the different freeze-thaw responses that would be expected at different NaCl concentrations. Path 1 describes a temperature change from +15 °C to -27 °C for an 8 % NaCl solution; decreasing the temperature from + 15 ºC causes no change in solution until the temperature goes below the liquidus line at slightly below -5 °C. At this point, pure ice begins to form in the solution and the concentration of unfrozen solution increases. Decreasing the temperature further causes the ice mass fraction to increase which is accompanied by increasing the concentration of the unfrozen solution. This action continues as the temperature decreases until it reaches the eutectic temperature (-21.1 °C). Below this temperature, just two phases are present including ice and the eutectic phase containing ice and NaCl·2H2O crystals (hydrohalite). The opposite action occurs when heating is applied to the system. When the temperature rises to -21.1 °C, the eutectic phase melts and as the temperature rises further, ice gradually melts into solution, thereby decreasing the solution concentration. When the temperature reaches the liquidus point, all of the ice converts to liquid. It should be mentioned that in the cooling process, undercooling is often seen and the phase transition occurs at a lower temperature than that expected from the equilibrium phase diagram. Path 2 and path 3 show a smaller range of temperature variation from +10 °C to -12 °C as is typically applied to the specimens for the freeze-thaw test in this study. 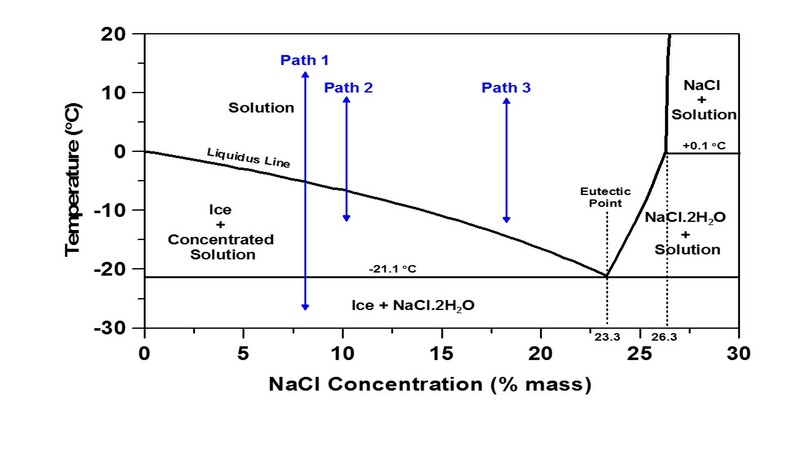 For the lower concentration of NaCl (10 %), path 2 passes the liquidus line inducing the formation of ice; however, the temperature does not reach as low as the eutectic temperature. Therefore, ice is formed and can cause expansion and damage to mortar specimens if adequate pressure relief (in the form of air voids or deformable particles) is not present in the specimen. However, if the higher concentration of NaCl solution is used (18 %, path 3), no phase change is expected to occur in the range of applied temperature i.e., it remains above the liquidus line. In this case, no freezing, expansion, nor damage is expected to occur. However, when NaCl is applied to concrete, other ions and solids are available for interaction with the Na+ and Cl- ions. Additional phases may form and/or undergo phase changes during the cooling/heating cycle as shown in the figure below. 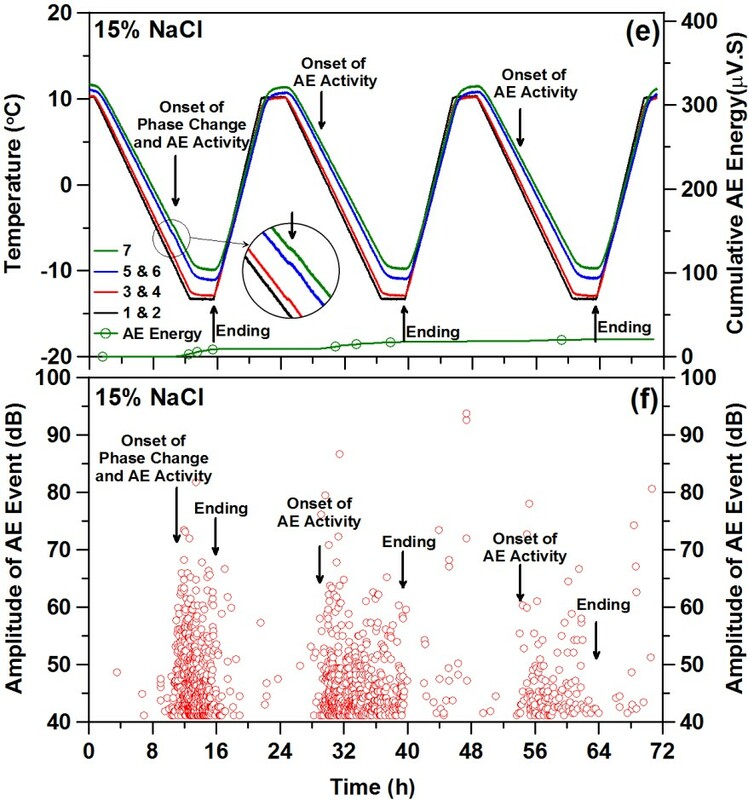 While no freezing of water should be present in the 15 % NaCl and 23.3 % NaCl cases, an additional unexpected phase change is observed during cooling (first figure below). 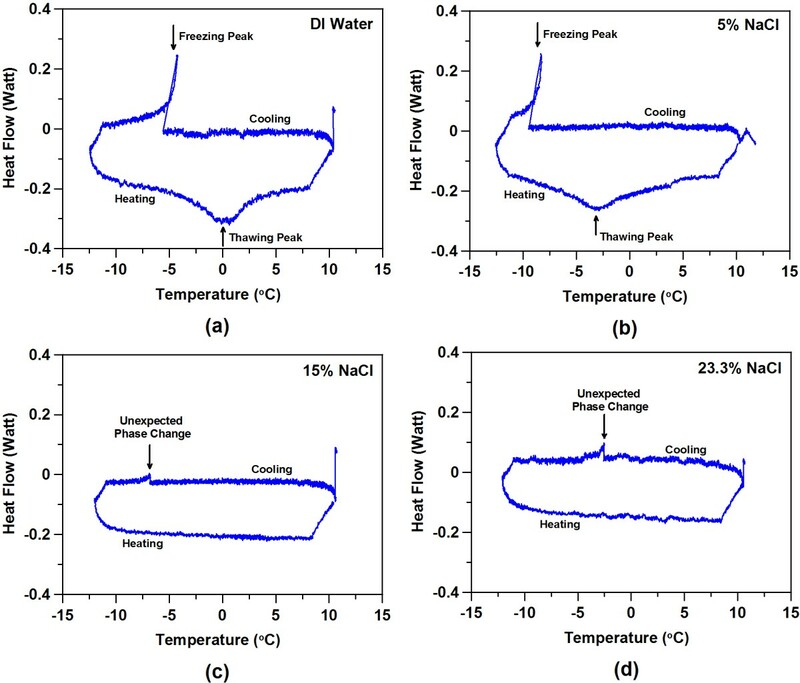 As shown below in the second figure, this phase change is accompanied by measurable acoustic activity, indicating the likelihood of cracking and damage in the mortar specimen even though it is protected from conventional freeze/thaw damage. 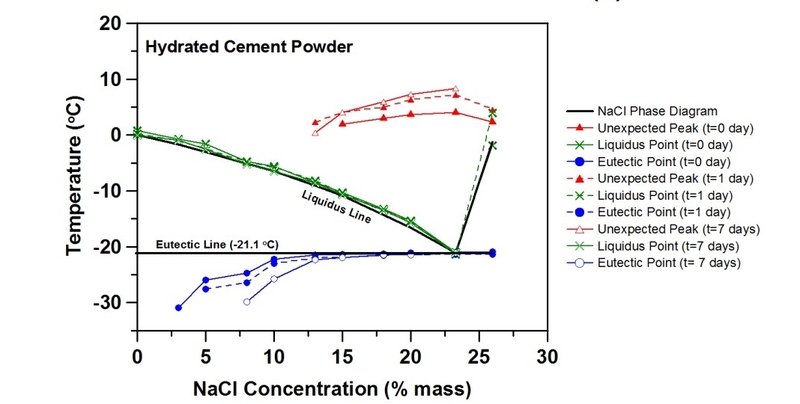 This suggests a modification to the NaCl phase diagram to include an extra transition when in contact with cement-based materials as shown below. For sodiu m chloride, x-ray fluorescence (XRF) imaging indicates a uniform penetration of chlorides to the center of the mortar prisms as indicated in the figure below. 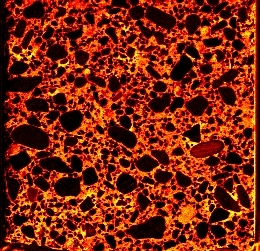 The sand particles show up as black, while a thermal scale (black to red to yellow to white) is used to indicate the local level of Cl- within the specimen. 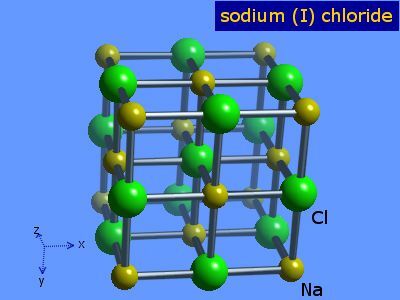 Mortar prisms were vacuum saturated with the 20 % NaCl solution and the XRF image indicates that a fairly uniform penetration of the solution (and Cl-) was achieved in this case.